It Spins, But Does It Clean Well? Find Out in This Review of the 2019 O-Cedar EasyWring Microfiber Spin Mop. Finally, someone figured out you can’t clean corners with a round mop head! The mop of the O-Cedar EasyWring Spin Mop & Bucket System is triangular in shape, perfect for getting into every nook and cranny in a home. But this is much more than a spin mop. 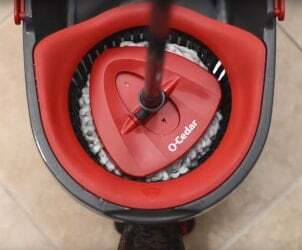 O-Cedar created a self-contained floor cleaning system that actually makes cleaning floors a quick and effortless chore. There are some missteps, though. More on them a bit later. But, the O-Cedar EasyWring is definitely a step up from the traditional spin mop. When it comes to defining the EasyWring, it’s more of a floor cleaning system than a spin mop. What’s the difference? Let’s compare the two. A spin mop is a single unit. It basically uses some form of powered spinning action to clean floors. Some units have a reservoir for the cleaning fluid, which you disperse as you go. A floor cleaning system is comprised of several components: the spin mop and a bucket for wringing out the mop. So it actually does double the work and provides an added convenience. With a complete floor cleaning system, it’s like having a mini sized commercial janitorial cleaning unit for your home. The O-Cedar floor cleaning system comes with the spin mop, a telescoping pole, a plastic base, a microfiber mop head and a push pedal bucket. Out of the box, you need to assemble the mop, which is easy enough, but still added steps for those who like ready to use out of the box spin mops. You first attach the telescoping pole onto the mop’s handle. Then, adjust the height by turning the mop’s handle to the left. Turn the handle to the right to lock in place. Next, attach the handle to the plastic base. Finally, the mop head snaps into the plastic base. The bucket system requires no assembly. It features two sides: one that holds the water and the other that wrings out the mop. The push pedal on the wringer side allows you to control how much spin to put on the mop. The more spin, the less water on the mop. Can use on all hard surfaced floors, including hardwood, tile and laminate. A mop head refill can be purchased separately. The manufacturer recommends changing the mop head every three months. However, go by usage. If you don’t use the mop every day, you might only have to change the head every six months. The workings of the spin mop and bucket are pretty basic. When you’re ready to clean, fill the water side of the bucket to the max line. The bucket is sized perfectly to fill in a regular kitchen sink. For those who like to clean with water and vinegar, this type of system accommodates that because you’re not actually putting the cleaning solution inside the unit’s reservoir. Instead, you put the mop in the water and move it about to get it evenly wet. Once completely wet, remove the mop and place it in the wringer side. Push the pedal to create the spinning action to the moisture level you want. While doing so, hold the mop handle loosely and at a 90 degree vertical angle to allow it to spin. Remove the mop and clean your surface. It’s important to clarify how the spin mop works. It’s not like some spin mops that are powered by battery or electricity. The mop’s spin is powered by your feet on the bucket’s pedal. This gives you the control to wring out the mop as damp or as dry as you like depending on the type of floor surface you’re cleaning. When you’re done cleaning, you can detach the mop head and machine wash or hand wash in warm water. As with all spin mops, avoid using bleach and fabric softeners. Additionally, this microfiber mop should not go in the dryer. Rather, lay flat to dry. Here’s a good feature to keep in mind. Although it’s a mop, you can use it wet or dry. So, if you want to just dust your floors, you can. And here’s another bonus: You can also remove the mop head from the handle and use it to dust furniture and other surfaces. Sort of a two-for value there. Definitely makes a difference when it comes to getting into corners and hard to reach areas. Besides the shape, the mop head pivots 360 degrees, so it really gets into tight spots and nicely glides around and under furniture. It would pass the white glove test, for sure. Do a better job of deep-cleaning. The material is known for its high performance, in terms of absorbency, picking up dirt and easy cleaning. The mop not only removed more dirt, it did a good job tackling grime, dust and hair, too. It is definitely noticeable how smooth and clear the floor is after mopping. However, with pet hair, a quick dry sweep or vacuum first would enhance the mop’s performance. 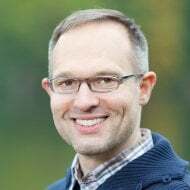 Is a great and valuable feature. It really kept any splashing and drips in the bucket and off the floor when wringing out the mop. While this is a good floor cleaning system, there are some areas where this O-Cedar mop falls a bit short. For example, it would have been nice if there was a divider in the bucket so one side had clean water and the wringing side the dirty water. This way, you’re not dipping the mop into the dirty, wrung out water. Wheels on the bucket would have been cool, too, for easy moving around. The telescoping handle also raises some concerns. While it’s a great feature being able to adjust it from 33 to 51 inches depending on your height, it could be sturdier. At its highest length, it felt somewhat unsteady. With regard to product quality, the mechanical parts are made of plastic, which creates some concerns in terms of durability. A stronger material for the mop wringer and foot pedal, for example, might have been a better option since they get the most usage. The microfiber mop head tackles tough dirt, stains and grime. The overall dimensions of the O-Cedar EasyWring Spin Mop & Bucket Floor Cleaning System are provided separately for the mop and the bucket. Material: The handle is made of metal, the mop head from plastic. The microfiber mop head is 30 percent more absorbent than other materials and superior in removing tough dirt, stains and grime. It is eco-friendly and machine washable. The mop strands should lay flat to dry. 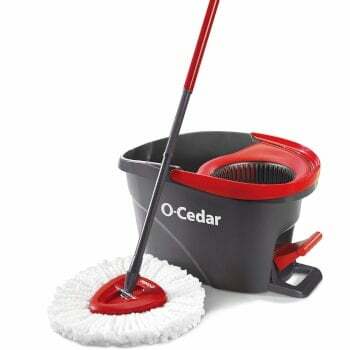 O-Cedar EasyWring Spin Mop Microfiber Refills are available to purchase. Recommended replacement is three to six months, depending on usage. According to the O-Cedar FAQs section, there is a satisfaction guarantee on all its products. You can either call the company’s toll-free number or use the website’s Contact Us form to submit a formal product issue inquiry. 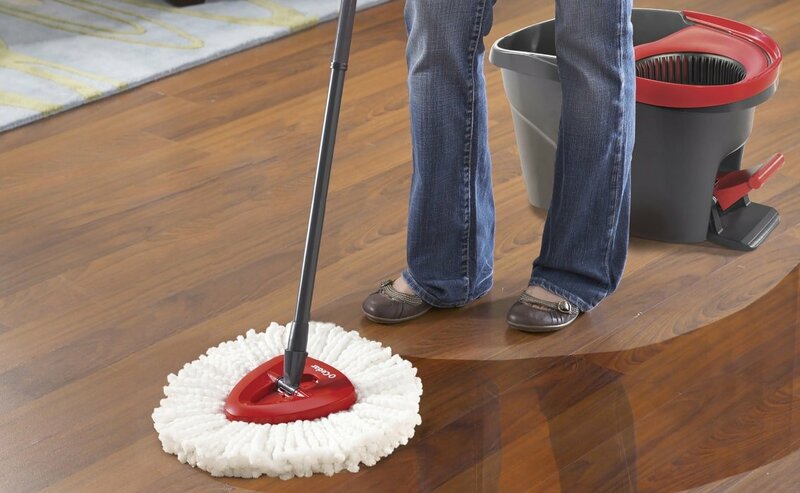 The whole point of having a spin mop floor cleaning system is to clean your floors without having to bend down or get wet doing so. In that sense, the O-Cedar EasyWring Spin Mop & Bucket System accomplishes that goal. However, it goes even further by including a bucket for the cleaning solution of your choice (no bleach) and wringing out the mop. That adds another layer of convenience by controlling how much water is applied to your floor and ensuring a quicker dry. 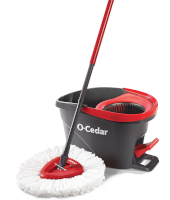 O-Cedar tops the mop with a 360 degree rotating mop head with microfiber strands to deeply clean in the smallest and hardest to reach places. Adding to the versatility is the ability to remove the mop head from the handle and use it as a duster. While the mop itself could have been built a bit sturdier, this is a good unit for the price. All in all, if you’re looking for an economical spin mop that gives you cleaning flexibility, this is a good option. After all, it comes from a company that has been making cleaning tools for over 100 years.